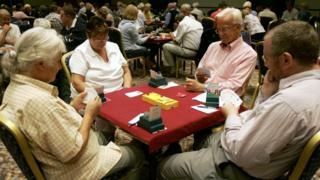 Bridge players who wanted the popular card game recognised as a sport have lost their High Court battle. The English Bridge Union had challenged a decision by Sport England not to recognise it as a sport because it does not involve physical activity. But Mr Justice Dove ruled against the union, dismissing its bid for a judicial review. The union said it was "very disappointed" and was reviewing its options for its next course of action. Bridge is played by four players in two partnerships. It uses a standard 52-card pack and involves predicting the number of tricks each side will win. The English Bridge Union (EBU) had wanted Sport England to reclassify the game, which would have made it eligible for government and lottery funding. It had claimed the ordinary and natural meaning of "sport" in the 1996 Royal Charter, which established Sport England, was sufficiently broad that it did not necessarily require physical activity. Lawyers told the High Court the game was based on rules, fairness and competition like other sports and was available to older people, to whom it brought a sense of inclusion and community. But the judge said Sport England's current policy defined sport as involving "physical activity" and its move to reject reclassification of bridge was right. The issue he had considered was whether Sport England officials had "erred in law" when refusing to classify bridge as a sport, the judge said - not the "broad, somewhat philosophical question" as to whether or not bridge is a sport. During the case Sport England had argued bridge was no more of a sporting activity than "sitting at home, reading a book". Speaking after the decision, Sport England's director of sport, Phil Smith, said: "Sport England's job is to help the nation to be more physically active, a role given to us by our Royal Charter. "We recognise that many people enjoy playing bridge, but that's not going to play a part in the fight against inactivity." Ian Payn, vice-chairman of the EBU, said the organisation was "very disappointed" about the decision which "affects participants in many sports other than bridge". The EBU's legal representative Alex Peebles said: "We feel that we put forward a strong case." Who, What, Why: Do bridge and chess make you fitter? Video Is bridge a sport or not?